Backyard fruit trees are a reemerging trend in our area. With a rising interest in locally grown foods, and organic production increasing, more folks are thinking about growing fruit at home. 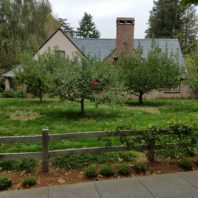 This class covers selection, site preparation, planting, care, and general costs of home orcharding. How to identify fruit trees by bark, leaves, blossoms and fruits. How to do a pre-planting site evaluation, as well as the conditions needed by different types of fruit. Introduce the proper cultural, mechanical, biologic and chemical techniques that can be used to protect harvest. Discuss the pros and cons of growing fruit at home. Costs and labor involved in growing fruit at home.